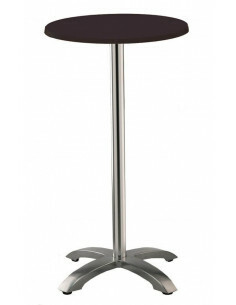 High table for bars and terraces finishing industry that brings a retro design and robust at the same time. The collection consists of stools, barstools, benches and high tables. For use indoors and outdoors. Various finishes available. 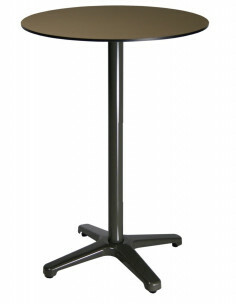 Outdoor aluminum high table for stool. 60,70c m diam. 60x60 and 70x70cm available. Tubular central structure with compact table top. 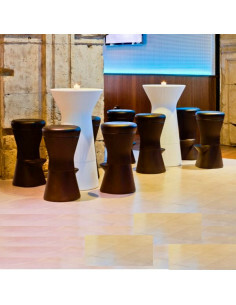 Contract bar high table for stools. 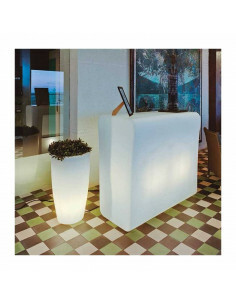 Table for outdoor and indoor use with painted aluminum base with compact table top. Diameter about 60 and 70cm. Stool table. Bar furniture series consists of a straight bar, curved bar, high table and stools that allow the perfect design for your terrace, local, garden, etc. 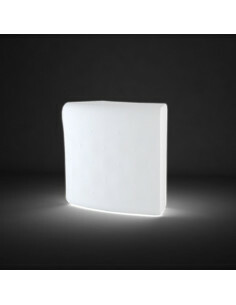 Available with lamp with solar charge and USB with LED RGB light bulb. 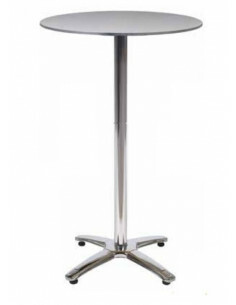 STOOL TABLE MAX SHINY PEDESTAL Pedestal base for indoor and outdoor table. Cast aluminium. Shiny painted finish. Anodized aluminium tube. Non-turn notch. Steel counterweight 4.5 kg (9.90 lb). See TOP dimensions: diameter 60cm. 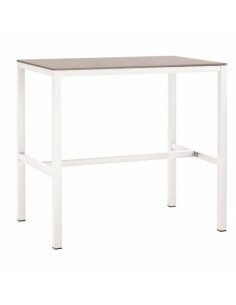 TOP materials: stainless steel bevelled table top or werzalit table top whiteand stratos (light gray) color. SPUTNIK TABLE Designed by Josep Lluscà. 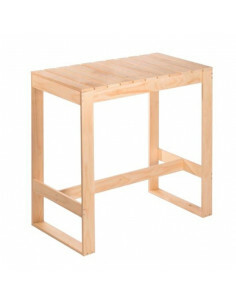 Stool table. 60cmx 109cm tall. 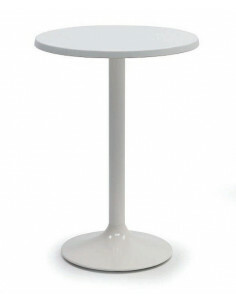 Single pedestal base table for indoor and outdoor use. with fenolic compact top. Curved bar counter. Bar furniture series consists of a straight bar, curved bar, high table and stools that allow the perfect design for your terrace, local, garden, etc. Available in white color with ligh. Bar counter. Bar furniture series consists of a straight bar, curved bar, high table and stools that allow the perfect design for your terrace, local, garden, etc. All pieces are available in white color with light . 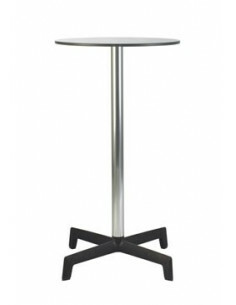 High table for bar stools or use of foot, of rectangular shape to bars and terraces industrial finish that adds a retro design and rugged at the same time. As only 104x55cm. For use in interior and in exterior. 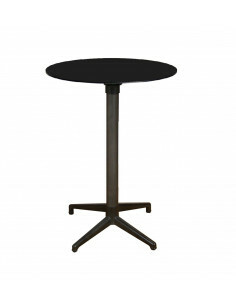 Aluminium structure in taupe / anthracite and table top on compact available in various colors. Round table for use inside and outside. Diameter 60cm x110cm tall. Anodized aluminum frame of 40x40 mm and 1.5 mm thick. Round base diameter of 35 cm and 6 cm diameter tube. White, black or sand colors. 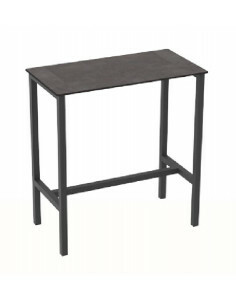 Table high bar in 2 dimensions: square or rectangular bars, and use in the kitchen as a breakfast table. Made of wood of solid pine with no varnish (natural color brown). If desired, the natural pine can be painted to give the desired finish (satin paint, rustic , decapada, etc.). 105cm in height. For use in interior. See stools to match. To furnish your local bar or restaurant, every detail counts. The bar is like its owner. 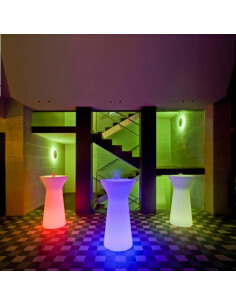 It is possible to organize the space with furniture that best suits the style and atmosphere of the bar or restaurant. The use of high tables is fashionable, being able to use the high tables both in the room and on the terrace of the bar. With the high tables a more informal atmosphere and a higher turnover of people is achieved. They combine with low tables to create different environments. We have light design tables for a quiet and relaxed atmosphere, tables to eat standing or stool, as they are a good alternative to offer the customer a better comfort and a more intimate space than at the bar. 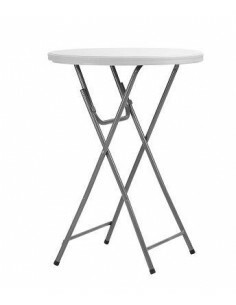 In the selection of stools and high tables, you will also find folding bars and high tables with a folding table to be able to remove the tables daily.